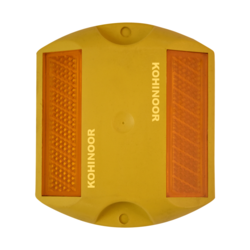 Our product range includes a wide range of kohinoor road stud ke-57, kohinoor cat eye road studs ke-55, pavement marker, raised pavement marker (rpm), molded shank rpm and abs road studs. We manufacture all type of Road Stud. 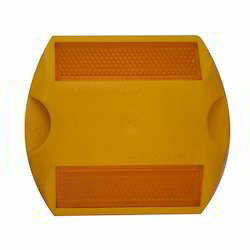 These road studs are called by various names in India namely: raised pavement marker, cateye, ABS Road Studs, Plastic road studs, pavement marker etc. They are developed as per the international quality parameters, this range of rod studs is used as a guidance lights for controlling heavy traffics. Owing to its clear and visible traffic guidance in any kind of weather condition, this range is widely demanded in the market. We are the manufacturer of Kohinoor Cat Eye Road Studs, widely used for road safety purposes. 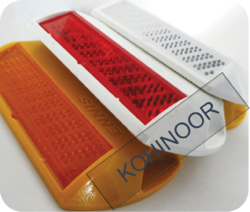 Kohinoor road studs are being extensivley used in National Highway, State highway and city roads. They are made from high quality ABS and are highly reflective and can withstand a load of more than 20 Tons. Extensively used in various busy traffic intersections, sharp curved roads, hilly areas fly-over, coastal areas, airport guidance light and dangerous and sharp road bends, this range is designed as par the international quality parameters. These road studs are available at reasonable rates. We are the one of the leading supplier and stockist of high quality Ennis C80 Series Road Stud. These road studs are also known as Avery Dennison Road Stud. These are used on paved roadways to provide guidance and information to drivers and to ensure smooth flow of traffic. Offered road stud is manufactured using the best quality raw material and advanced technology. 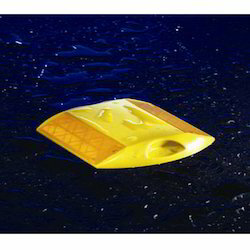 We are the leading suppliers of all type of 3M Raised Pavement Markers in India. 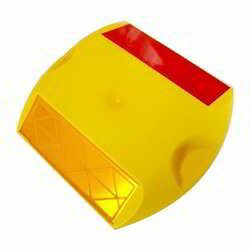 These reflective road studs are the best in class and these road studs can withstand a load of 20 Tons. Durable, lightweight and impact resistant. Provides both wet and dry reflectivity. We have marked a distinct position in the market by providing high quality 3M Molded Shank RPM. Mainly used in national and state highways. These studs can withstand high loads and are more durable than the regular studs. We are the manufacturers of ABS Road Studs. Provided in different designs and specifications, these studs are manufactured using superior quality ultrasonic welding process of ABS base plate and ultra-modern technology in adherence with industry norms. The offered studs are highly appreciated in the market for their various quality attributes. Besides, clients can avail these studs from us at pocket friendly prices. 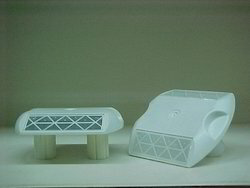 We manufacture and supply all type of Aluminum Road Studs. That includes with nails, without nails, with shank and without shank. Aluminum studs with 21 glass elements, 43 glass elements, prismatic sheeting or prismatic reflector viz road studs are customized as per the requirement. The studs are made of high quality Aluminum high pressure die castes material and can withstand a compressive load as per the ministry standards.